iOS is so restricted! You can’t even transfer files directly through a simple cable. Apple thus created iTunes, which served as a middleman between the PC and the iPhone. It might look like a limitation of Apple’s flagship – but have a look at its features – OOH LA LAA! Can Android have the same royal facilities that iPhone gets? The answer might seem no – until you discover something called “MobileGo” from Wondershare. 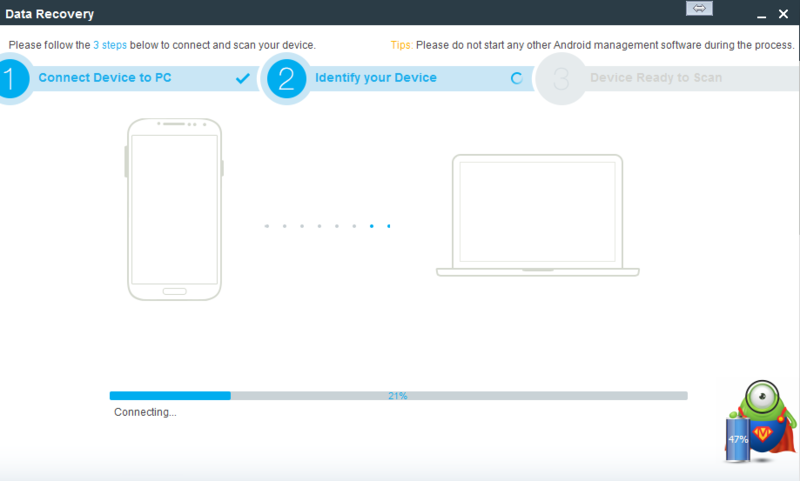 Yes, Wondershare MobileGo is the deluxe solution for PC connectivity for Android. It’s not just yet another file managing software – you can do a lot with it. There are tons of features, out of which many are literally unexpected for an Android PC suite. So stay tuned to know what MobileGo for PC has on cards for you. Note: Just because I compared iTunes with MobileGo in such a manner doesn’t mean that MobileGo doesn’t support iOS devices. In fact, it actually does. So keep that fact in mind before reading the review. Wondershare MobileGo is a really deep software. You will need to dig into it to realize its complete potential. You can connect your device in two ways – either through USB or Wi-Fi. Therefore, in case you can’t find your USB cable, you can still connect your phone provided your PC and phone are connected to the same Wi-Fi. However, note that some features don’t work when connected with Wi-Fi (For example, certain features which require USB debugging). Once your device is connected, you can transfer files to and fro easily through an in-built file manager. You will find a small green colored cartoon at the bottom of the screen while MobileGo is running. Drag files from your system to the cartoon and they will be transferred to your smartphone directly. Simple, isn’t it? 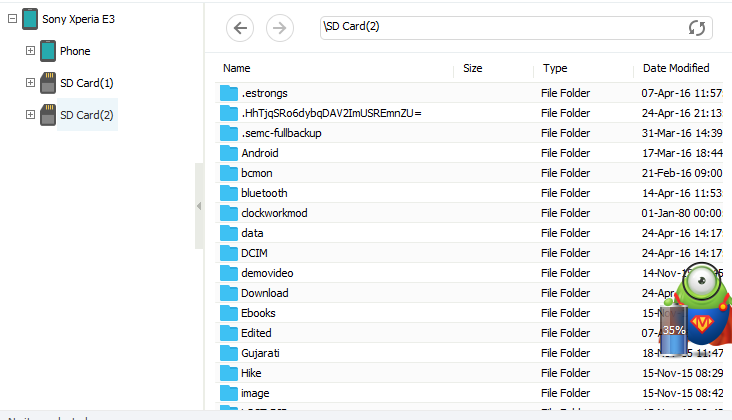 Wondershare MobileGo will scan all your files and sort them out into various categories such as music, videos, pictures, etc. 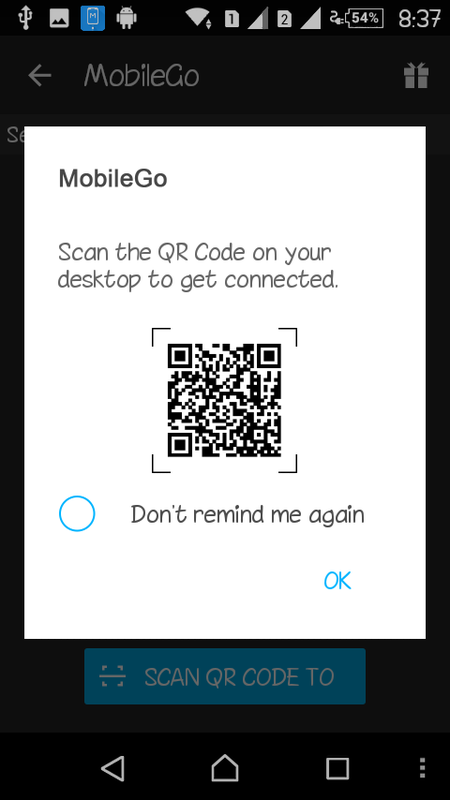 MobileGo for PC will even scan your contacts and show them. Moreover, you can also access your text messages. Lastly, there’s an app manager as well from where you can export apps, change their storage location, etc. Wondershare cares for you – MobileGo also has an Android app. It is available on Google Play, but you won’t need to download it manually. The software will install the app directly to your device as soon as you connect it. Moreover, it has some privacy-related features such as app locker, safe eraser, and hidden pictures. You can consider it as a cutting edge alternative to apps such as Clean Master. 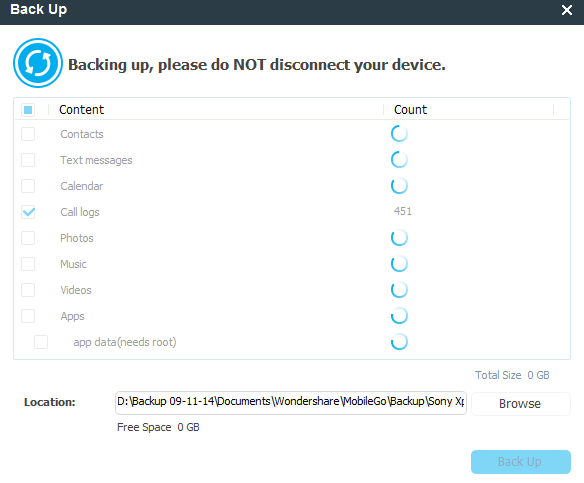 Forget Helium, Titanium Backup, and other apps – MobileGo supports one click backup and restore. You can choose what you want to backup – the backup generator will work accordingly. The software will first calculate the size of the backup, and then will ask you what you want to choose. While restoring, simply choose the backup file and wait. Your work will be done! The main reason why I love MobileGo is its flexibility at importing and exporting stuff. You can import or export contacts from Windows Live Mail or Microsoft Outlook directly. Or you can import and convert audio files to supported formats and export it. The same can be done for videos either. Moreover, you can even export the audio files to iTunes directly. Moreover, MobileGo can import playlists from iTunes. As you can see, MobileGo is pretty comfortable with transferring data from one place to another. 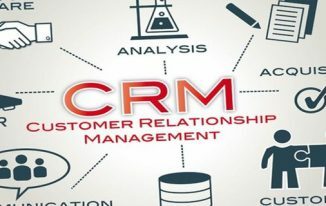 You will hardly ever find such software that offers similar functionality. This is what makes Wondershare MobileGo unique. Rooting my phone? Are you kidding me? Most users are afraid of rooting their device. They behave so because they are not familiar with the concept of rooting. They can’t do it because they don’t know how to. The fear of making mistakes hampers them. Also, most one click root apps in the market are accused of stealing user data or installing malicious apps without permission. MobileGo has brought the ultimate solution by providing trusted and safe one click root feature. No technical skills required – press the button, have a small break and your phone will be rooted. Walao! Phone-to-phone transfer: Do you want to transfer data from phone to phone complicated? It’s quite tough when the operating system is different on both the devices. In most cases, you will find yourself so confused that you won’t even have a clue about what to do. But don’t worry! MobileGo for PC guarantees that it can transfer data from any phone to any phone regardless of the model, operating system or carrier. Simply plug in both the devices and choose what you have to transfer. Data recovery: I haven’t found an app yet on the Android market which lets you recover data from your Android device. Surprisingly, MobileGo does support that feature. Logically, it’s possible to recover data – and MobileGo exactly knows how to do that! You might have found software such as EaseUS data recovery which does work – but they don’t support smartphones as of now. Data eraser: Planning to discard your smartphone? Clean it first to avoid sensitive data leakage. Your personal data is so established on your Android device that it needs to be cleaned carefully in order to protect privacy. Fortunately, MobileGo actually does that! The software scans your mobile storage carefully and removes every single file that could probably void your privacy. The process takes time – around 2 hours, so be patient while you go through that. 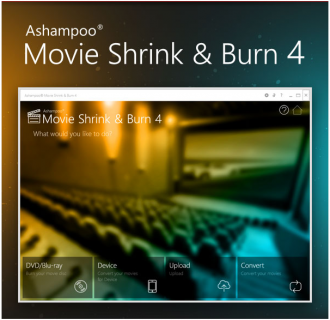 MirrorGo: What if I told you that you can replicate your phone screen on your PC just like a projector? What if I told you that you can even control your phone through that replication? Well, this might be a fun feature only – but MirrorGo, which is an extension of MobileGo, actually supports that. Do the replication with a click and control your smartphone with your keyboard and mouse. Sounds awesome, doesn’t it? The pricing is absolutely simple – either pay $25 for a year for 1 PC or pay $30 for a lifetime license. If you’re smart enough, you would obviously go for the latter. 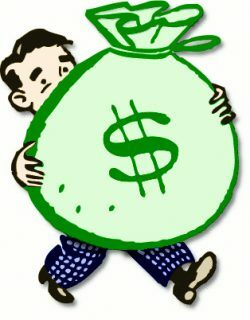 Business plans for lifetime licenses for more than 1 PC are coming shortly as promised by Wondershare. I hope you liked my MobileGo review. 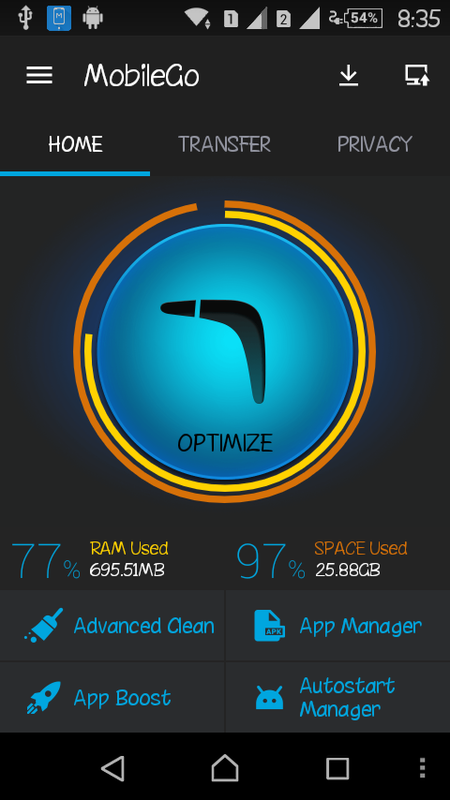 MobileGo for PC is really a one-stop destination for Android management. Its addition of a helping mobile app is really helpful. What do you think about this awesome software? Let us know your views in the comments section below? Create Fake Voice with Voice Changer for PC. 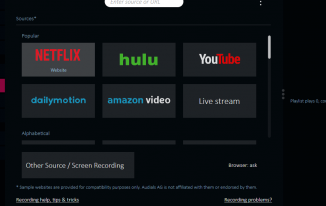 7 Voice Changer Software Listed. So sweet & detailed review. I have also read many reviews about this product. By this Software, we can transfer Audio and videos quickly. I will try this Software. Thanks for liking the review, Saurabh. Glad you liked it. This is a nice mobile manager in my views. I have recently used it and found very useful. Happy that you liked it, Martin. Thanks for reaching out here and leaving your comment. It looks like Wondershare Mobile go is pretty awesome with lots of features. I will definitely download and try this out on my smartphone. Thanks for the information. That’s a fantastic mobile manager with PC. Thanks for sharing this information with us. A detailed review about MobileGo. You don’t even have to install it manually – user friendliness at its best! Also liked the one click backup and restore along with the privacy features. The price for lifetime license seems minimal as compared to the vast list of features it offers. Thanks for sharing. Take care. I love products from Wondershare as they are so user-friendly and easy to use. Features are full packed. Thanks for coming by. Well-written review! 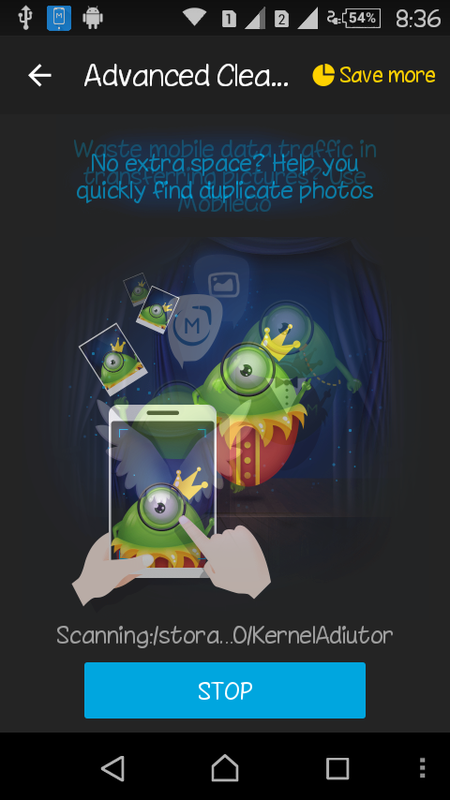 With MobileGo, you can export the contents of your phone to your PC, and you can transfer content over to your phone. If you’d like to transfer a file that is not in a supported format, MobileGo handles the work for you, notifying you of the incompatibility and handling the file conversion for you. VPN Vs. Proxy. Which One to Choose?